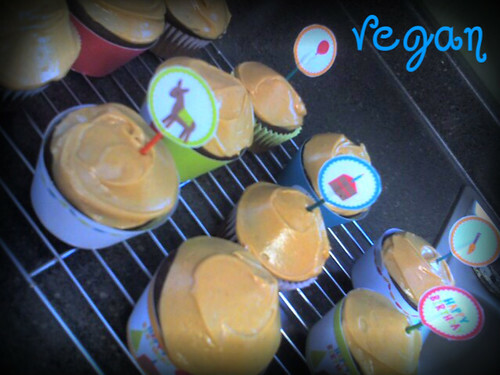 These cupcakes quickly became a favorite in our household! This awesome AWESOME recipe is from Vegan: On The Cheap! by Robin Robertson. I LOVE this cookbook – not only does it have great ideas for meals, it does it all for cheap! This particular recipe she calculated out to be less than $0.50 per serving! 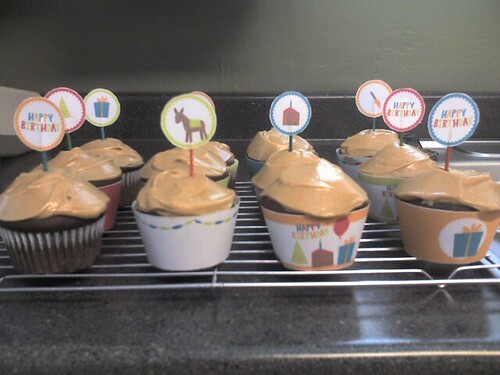 Make the cupcakes Preheat the oven to 350 degrees F. Grease or line a 12-cup muffin tin with paper liners. Set aside. In a large bowl, combine the flour, cocoa, baking powder, baking soda, and salt. Set aside. In a separate bowl, cream together the sugar and margarine. Add the water and vanilla and mix until smooth. Add the flour mixture, a little at a time, and mix until well incorporated. Beat until smooth, 1 minute more. Spoon the batter into the prepared tin, filling the cups about two-thirds full. Bake until a toothpick inserted in the center of a cupcake comes out clean, about 25 minutes. Set aside to cool on a wire rack or about 20 minutes or until completely cool. Make the frosting In a food processor, blend the peanut butter, margarine, and vanilla until smooth. Add the sugar and process until smooth and creamy. Scrape into a medium bowl and set aside. When the cupcakes are completely cool, frost them with the frosting. These taste best if eaten on the same day that they are made. If not using right away, cover and store at room temperature for up to 2 days. Oh that one looks sweet and creamy! For the frosting , next time you can try to use avocado butter cream.